Croatia, officially the Republic of Croatia, is a unitary democratic parliamentary republic at the crossroads of Central Europe, the Balkans, and the Mediterranean. Its capital and largest city is Zagreb. Croatia covers 56,594 square kilometres (21,851 square miles) and has diverse, mostly continental and Mediterranean, climates. Croatia's Adriatic Sea coast contains more than a thousand islands. 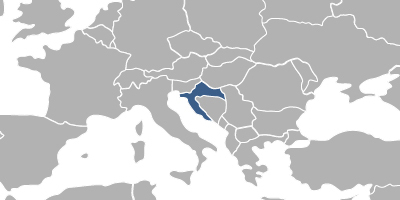 Croatia is located in Central and Southeast Europe, bordering Hungary to the Northeast, Serbia to the East, Bosnia and Herzegovina to the Southeast, Montenegro to the Southeast, the Adriatic Sea to the Southwest and Slovenia to the Northwest. The country's population is 4.28 million. Having joined on 1 July 2013, Croatia is the newest, 28th member state of the European Union. Fees associated with registration of IP rights in Croatia are available in the fee calculator.